On 27 February 2012, we learn of the Putin Assassination Plot.Ukrainian and Russian security services have gathered information about a plot to assassinate Putin, who is due to be elected president on 4 March 2012. One of the assassins, Ilya Pyanzin, said that the Chechen militant leader Doku Umarov hired him to kill Putin. The Chechen militants are said to be linked to the CIA, Mossad and NATO. Pyanzin came from the United Arab Emirates via Turkey to Ukraine. The United Arab Emirates and Turkey are said to have close links to Mossad and the CIA. The alternative to Putin is the Communist Party, which has in the past had firm links to Israel. “Putin stands – as no other major leader does in the world today – for the rights of nations to decide their own business inside their own borders. “He has underlined that by refusing to join in the rash American-backed effort to destabilise the Assad regime in Syria. “He has dared to wield a real veto (unlike David Cameron’s disposable cardboard one) and face the consequences. “He has used his country’s huge oil and gas reserves to maintain an independent state. “And he has rejected the current mania for privatisation and market forces as the cure for all ills. PETER HITCHENS: If not Putin, who? I can see the point of this man who stands up for Russia. The alternative to Assad is the CIA’s al Qaeda. The idea that the Bilderberg Group is behind the creation of a mysterious future World Government has been spreading for years. Having had access to the archives of this very secret club, Thierry Meyssan shows that this belief leads in a false direction, serving to mask the true identity and function of the Group. In reality, the Bilderberg Group is a creation of NATO. It aims to influence key leaders on a global scale and, through them, to manipulate public opinion to get it to embrace the ideas and actions of the Northern Atlantic Alliance. Every year since 1954, over one hundred of the most prominent personalities of Western Europe and North America meet – behind closed doors and under maximum security – within the Bilderberg Group. This exclusive seminar lasts for three days and almost nothing of the debates filters to the outside world. Since the breakup of the Soviet Union, numerous journalists have taken an interest in this secretive, elitist organization. Certain authors have seen it as the beginning of a World Government, responsible for the major political, cultural, economic and military decisions of the second half of the twentieth century. This interpretation has also been voiced by Fidel Castro, but it has never been confirmed nor invalidated by any solid facts. In order to find out what the Bilderberg Group is or isn’t, I searched for documents and first hand witnesses. I obtained access to all of its records for the period 1954-1966 and numerous later documents, and I was able to talk with a former participant that I’ve known for years. No other journalist to date, including the authors who have popularized today’s stereotypes, has had access to this wealth of internal documents of the Bilderberg Group. 70 personalities from 12 different countries attended the first meeting of the Group. It was a three-day seminar, from May 29 to 31, 1954, near Arnhem (Netherlands). The guests were housed in two nearby hotels, but the debates were held in the Bilderberg Hotel, which gave the Group its name. The invitations with a letterhead from the Soestdijk Palace are intriguing: “I earnestly request your presence at the informal International Conference, to be held in the Netherlands in late May. This conference wishes to explore a number of issues of great importance for Western civilization and is intended to stimulate mutual understanding and goodwill through a free exchange of views.” The invitations were signed by the Prince Consort of the Netherlands, Bernhard zur Lippe-Biesterfeld, and accompanied by several pages of administrative information concerning transportation and accommodation. At most, we learn that the delegates originated from the United States and 11 from Western Europe, and that 6 sessions of 3 hours each were scheduled. Given the Nazi past of Prince Bernhard (who had served in the SS cavalry until his marriage in 1937 to Princess Juliana) and in the context of McCarthyism in the U.S., it’s clear that the “issues of great importance for Western civilization” revolved around the struggle against communism. Once there, the anticipation of the guests was mitigated by the two chairmen: U.S. entrepreneur John S. Coleman and outgoing Belgian Minister of Foreign Affairs Paul van Zeeland. The first was an active partisan of free trade and the second a supporter of the European Defense Community (EDC) . Last but not least, at the far end of the table (see photo) sat Joseph Retinger, the intellectual influence behind the British. 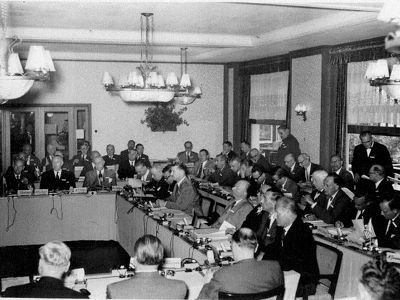 All this suggests that the Dutch and British monarchies sponsored this meeting to support the European Defense Community and the economic model of free-market capitalism against the anti-Americanism that the Communists and the Gaullists were promoting. However, appearances are deceiving. The goal was not to campaign for the EDC, but to mobilize the elite for the Cold War. His Royal Highness, Prince Bernhard, was chosen to convene this conference because his status as a prince consort would give it a Stately character without being formal. In fact, he was used to hide the real sponsor: an inter-governmental organization which intends to manipulate the governments of some of its Member States. John S. Coleman was not yet the President of the Chamber of Commerce of the United States, but he had already created the “Citizen’s Committee for a National Trade Policy” – CCNTP. According to him, absolute free trade, that is to say, the renunciation of all customs duties, would allow countries allied with the United States to increase their wealth and finance the European Defense Community (in other words, rearm Germany and integrate its potential military power within NATO). However, the documents in our possession show that the CCNTP was a “Citizen’s” committee in name only. This is actually an initiative of Charles D. Jackson, the White House psychological warfare adviser. The operation was controlled in reality by William J. Donovan, the former commander of the OSS (the U.S. intelligence service during the war), now in charge of building the American branch of the new secret service of NATO, Gladio . Paul van Zeeland was not only the promoter of the European Defense Community, but also a politician of great experience. At the Liberation, he chaired the Independent League for European Cooperation (ILAE) whose objective was to create a customs and monetary union. This organization was established by Joseph Retinger, mentioned earlier. Specifically Retinger, who was acting as secretary for the Bilderberg conference, served during the war in the English secret services (OES) of General Colin Gubbins. A Polish adventurer, Retinger found himself advisor to the Sikorski government in exile in the United Kingdom. In London, he livened up the small world of governments in exile and compiled one of the best address books in newly liberated Europe. His friend, Sir Gubbins, officially left the service and the SOE was disbanded. Retinger ran a small textile business, which served as a “cover”. In fact, alongside his counterpart Donovan, he was responsible for creating the English branch of Gladio. He participated in all of the preparatory meetings of the Bilderberg conference and was present among the guests, seated next to Charles D. Jackson. Unknown to the participants, the secret services of NATO were, in fact, the organizing power behind the scenes. Bernhard, Coleman and Van Zeeland were used as fronts. Contrary to the idea developed by the creative journalists who imagined the Bilderberg Group forging a secret World Government, this club of influential leaders is in reality a lobbying tool to promote NATO’s interests. It is in fact much more serious and dangerous, because it is NATO which aims to be the secret World Government – guaranteeing the international status quo and maintaining U.S. influence. Moreover, the security of each subsequent meeting was not provided by the police of the host country, but by the soldiers of the NATO Alliance. Among the ten speakers, there were two former Prime Ministers (Guy Mollet, France, Alcide de Gasperi, Italy), three officials of the Marshall Plan, the Cold War hawk (Paul H. Nitze) and, above all, an extremely powerful banker (David Rockefeller). According to the preparatory documents, approximately 20 people were in the inner circle. They knew more or less in detail those who were pulling the strings and preparing in advance their work. The smallest details were prepared before hand and nothing was left to chance. On the other hand, the fifty other participants knew nothing of what was happening behind the scenes. They were chosen to influence their respective governments and public opinion in their countries. The seminar was organized to convince these leaders and incite them to diffuse the point of view of the NATO Alliance in their respective countries. The debates didn’t address the major international problems, but rather analyzed the supposed ideological strategy of the Soviets and set out how it should be countered by the “free world“. The first statements assessed the communist threat. The “conscious communists” are individuals who intended to put their homeland at the service of the Soviet Union in order to impose a collectivist world. They must be fought. But it was a difficult challenge because these “conscious communists” in Europe were embedded with a mass of Communist voters who knew nothing about their evil plans and followed them in hopes of improved social conditions. Gradually, the rhetoric became more radical. The “free world” must oppose the “world communist conspiracy“, not only in a general way, but also by responding to specific questions concerning U.S. investments in Europe or on decolonization. Finally, the speakers addressed the main problem which the Soviets, according to them, were exploiting to their advantage. For cultural and historical reasons, the political leaders of the “free world” used different arguments in the U.S. and in Europe, arguments that sometimes contradicted one another. The most emblematic cases are the purges organized by Senator McCarthy in the United States. They were essential to save democracy, but the method was perceived in Europe as a form of totalitarianism. The final message was that no diplomatic negotiation, no compromise was possible with the “Reds“. The role of the Communists in Western Europe had be prevented at any cost, but it would take cunning: as they cannot just be arrested and shot. They should be neutralized discreetly, without their voters realizing what’s happening. In short, the ideology developed was that of NATO and Gladio. No one said that elections should be rigged or that moderates should be assassinated, but all participants agreed that to save the “free world“, that freedom should be put “in brackets”. Although the proposed European Defense Community (EDC) was defeated three months later in the French Parliament under the attacks of the Communist deputies and the “nationalist extremists” (in other words, the partisans of de Gaulle), the Congress was none the less considered a success. Despite appearances, there was no intention to support the creation of the EDC or any other specific policy. The real goal was to spread the ideology of the ruling elite by influencing the opinion makers, who in turn would influence the rest of society. Objectively, the Western Europeans were less aware of the freedoms that they were being denied and increasingly aware of the freedoms that were not available to the people of Eastern Europe. A second conference was held in Barbizon, France, from March 18th to 20th 1955. The idea that the conferences would be held annually and that they required a permanent secretariat became increasingly evident. Prince Bernhard became less visible after he was caught influence peddling (Lockheed Martin scandal). He was replaced by the former British Prime Minister Alec Douglas Home (1977-80). The following Presidencies were held by former German Chancellor and President Walter Scheel (1981-85), former Governor of the Bank of England Eric Roll (1986-89), former NATO Secretary General Peter Carrington (1990-98), and finally the former vice-president of the European Commission Etienne Davignon (since 1999). For many years the Chairman of the Bilderberg Group was assisted by two Secretary Generals, one for Europe and Canada (the vassal states) and one for the U.S. (the ruler), however, there has been only one Secretary General since 1999. From one year to the next, the debates have been highly redundant. This is why the guests change regularly. But there is always a core group who prepares the conference in advance and the newcomers who are taught the atlanticist rhetoric in vogue. Currently, the annual seminars bring together over 120 participants, including one third of the permanent core group members. They were selected by the Alliance based on their social network and their capacity to influence the rest of society, irrespective of their particular functions in society. Thus, they remain members of the core group even after changing their job. Here is the exact list of the core group, including members of the Board of Directors, which serve as fronts for the guests, and the less visible members, in order to not scare away the newcomers. Josef Ackermann Swiss Banker, head of Deutsche Bank, Vice-Chairman of the Forum in Davos. Roger C. Altman U.S. Banker, a former campaign adviser to John Kerry and Hillary Clinton, Chairman of investment Bank Evercore Partners Inc.
Henri de Castries CEO of the French insurance-company AXA. Juan Luis Cebrián Director of the Spanish media and broadcasting group Prisa. W. Edmund Clark Canadian banker, CEO of Toronto-Dominion Bank Financial Group. Kenneth Clarke Former vice president of British American Tobacco (1998-2007), British minister of Justice, vice president of the European Movement UK. George A. David CEO of Coca-Cola. 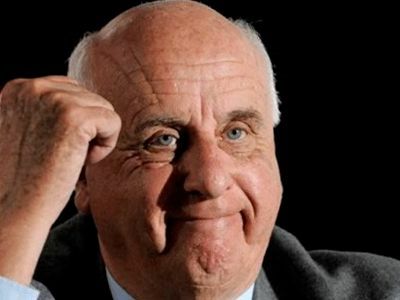 Étienne Davignon Belgian businessman, former vice president of the European Commission (1981-85), current vice president of Suez Tractebel. Anders Eldrup CEO of the Danish gass and oil corporation DONG Energy. Thomas Enders Director of Airbus. Victor Halberstadt Economy professor at the Dutch university of Leiden, business-consultant for various corporations such as Goldman Sachs and Daimler-Chrysler. James A. Johnson U.S. financier, he was a major contributor to the Democratic Party and an architect of the nomination of Barack Obama. He is vice-chairman of the investment bank Perseus. Klaus Kleinfeld German CEO of the U.S. aluminium giant, Alcoa. Mustafa V. Koç CEO of Koç Holding, the largest Turkish company. Marie-Josée Drouin-Kravis Economic columnist in print and broadcast media in Canada. Researcher at the very militaristic Hudson Institute. She is the third wife of Henry Kravis. Jessica T. Mathews Former Director of Global Affairs at the National Security Council of the United States. Current director of the Carnegie Foundation. Thierry de Montbrial Economist, founding director of the French Institute for International Relations (IFRI) and the World Policy Conference. Mario Monti Italian economist, former European commissioner for the protection of free-trade (1999-2005), co-founder of the Spinelli Group for European federalism. Egil Myklebust Former president of Norwegian employers, director of Scandinavian Airlines System (SAS). Matthias Nass Assistant director of the German Newspaper Die Zeit. Jorma Ollila Finnish businessman, former CEO of Nokia, current president of Royal Dutch Shell. Richard N. Perle Former Chair of the Defense Policy Board Advisory Committee at the Pentagon, He is a key leader of the Straussians (disciples of Leo Strauss) and as such, a major figure of neo-conservatism. Heather Reisman Canadian businesswoman, CEO of the Publishing Group Indigo-Chapters. Rudolf Scholten Former Austrian Finance Minister, Governor of the Central Bank. Peter D. Sutherland Former Irish EU Commissioner for competition, then director general of the World Trade Organization. Former director of British Petroleum, current chairman of Goldman Sachs International, former President of the European section of the Trilateral Commission, and Vice-President of the European Round Table of Industrialists, now honorary president of the European Movement – Ireland. J. Martin Taylor Former MP, CEO of the chemical and agribusiness giant Syngenta. Peter A. Thiel U.S. Businessman, CEO of PayPal, president of Clarium Capital Management and Facebook shareholder. Daniel L. Vasella CEO of the Swiss pharmaceutical group Novartis. Jacob Wallenberg Swedish banker, he is the director of many transnational companies. Henry Kissinger is the main person responsible for invitations to the Bilderberg Group. Oscar Bronner CEO of the Austrian daily Der Standard. John Elkann CEO of the Italian group Fiat Auto (his grandfather Gianni Agnelli was for forty years one of the leaders of the Bilderberg Group. He inherited the family fortune after the natural death of his grandfather Giovanni and the premature death of his uncle Edoardo. However, police sources were convinced that Edoardo was murdered after he converted to Shia Islam, so that the family fortune would remain within the Jewish branch of the family). 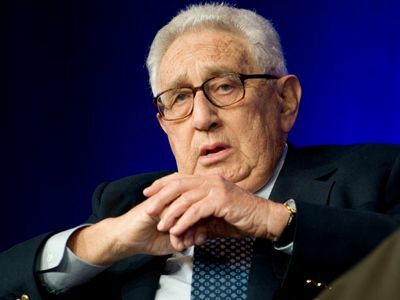 Henry A. Kissinger Former national security adviser and U.S. Secretary of State, central figure of the U.S. military-industrial complex, current president of the consulting firm Kissinger Associates. Henry R. Kravis U.S. financier, investment fund manager KKR. He’s a major fundraiser for the Republican Party. Neelie Kroes Former liberal Dutch minister of Transport, European commissioner for competition, and current Commissioner of the digital society. Bernardino Léon Gross Spanish diplomat, Secretary General of the Presidency of the Socialist Government of Jose Luis Zapatero. Frank McKenna Former member of the Supervisory Commission Canadian Security Intelligence Service, Canada’s ambassador in Washington (2005-06), Vice-President of the Toronto-Dominion Bank. Queen Beatrix of the Netherlands She is the daughter of Prince Bernhard. George Osborne British Minister of Finance. This neo-conservative is seen as a eurosceptic, meaning that he is opposed to the participation of the United Kingdom in the European Union, but he is a supporter of the organization on the continent within the Union. Robert S. Prichard Canadian economist, director of print and audiovisual Torstar. 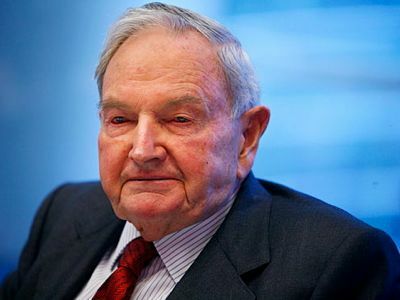 David Rockefeller The patriarch of a long line of Bankers. He’s the oldest member of the core group of Bilderbergers. He is also chairman of the Trilateral Commission, a similar organization incorporating Asian participants. James D. Wolfensohn Australian Banker who acquired U.S. citizenship to become President of the World Bank (1995-2005), now director of the consulting firm Wolfensohn & Co.
Robert B. Zoellick American diplomat, U.S. diplomat, former U.S. Trade Representative (2001-05), current president of the World Bank. The Bilderbergers don’t necessarily represent the companies or institutions in which they work. However, it is interesting to observe the diversity of their political and economic influence. In recent years, the number of topics discussed at the annual conferences has increased to keep up with world events. But the subjects of discussion are not really important, because the discussions have no precise objectives in and of themselves. The conferences are merely a pretext to convey other messages. Unfortunately, we do not have access to the most recent preparatory documents and we can only speculate about the directives that NATO will try to disseminate through these leaders of opinion. The reputation of the Bilderberg Group has led some authors to imagine that the Group nominates people to important positions. This is ridiculous and it obscures those who truly pull the strings behind the scenes within the Atlantic Alliance. For example, during the last U.S. presidential elections, it was reported that Barack Obama and Hillary Clinton disappeared on June 6, 2008, in order to negotiate an end to their rivalry. In reality, they participated in the annual conference of the Bilderberg Group in Chantilly, Virginia (USA). The following day, Mrs. Clinton announced that she was retiring from the race. Some authors concluded that the decision was taken during the Bilderberg meeting. The logic is faulty, since the decision was already a foregone conclusion three days before, given the number of votes for Senator Obama at the Democratic Party’s nominating committee. According to our sources, something else happened. Barack Obama and Hillary Clinton concluded a financial and political agreement. Senator Obama bailed out his rival financially and offered her a position in his administration (Clinton refused the vice-presidency and instead chose the State Department) in exchange for her active support during the campaign against McCain. Then, the two leaders were presented by James A. Johnson to the Bilderberg Conference, where they assured the participants that they would work together. Barack Obama had already been NATO’s candidate for a long time. Mr. Obama and his family have always worked for the CIA and the Pentagon. Moreover, the initial funds for his campaign were provided by the Crown of England, via a businessman named Nadhmi Auchi. In presenting the Black Senator to the Bilderbergers, the Atlantic Alliance was, in fact, organizing public relations at the international level for the future president of the United States. Similarly, it was reported that the Bilderberg Group held an impromptu dinner outside of the Conference on November 14th, 2009 at the Chateau de Val Duchesse, owned by the King of Belgium. The former Prime Minister of Belgium, Herman van Rompuy, delivered a speech. Five days later he was elected president of the European Council. Once again, some authors wrongly concluded that the Bilderberg Group had been the “kingmaker”. In reality, the President of the European Union could not be chosen outside of the NATO circles, and it should be remembered that the European Union itself was the result of several secret clauses in the Marshall Plan. In addition, this choice must be endorsed by the Member States. This type of decision requires lengthy negotiations and is obviously not taken during an informal dinner with friends. Also according to our source, the Bilderberg Group President, Etienne Davignon, convened this special dinner to introduce Van Rompuy to his influential relays. These contacts were all the more necessary since the first person to occupy the new post of President of the European Council was totally unknown outside of his own country. During the meal, Mr. Van Rompuy outlined his program for creating a European tax to directly fund the institutions of the Union without going through the Member States. The role of the Bilderbergers was to proclaim far and wide, that they know Herman von Rompuy and testify to his qualities to chair the Union. The reality of the Bilderberg Group is less romantic than some authors have imagined. The incredible deployment of military force to ensure security during the meetings is not so much intended to protect, but rather to impress those who participate. It does not display their power, but instead shows that the only real power in the West is NATO. Everyone has the “choice” to either support NATO and be supported by it… or fight it and be relentlessly crushed. In addition, although the Bilderberg Group developed an anti-communist rhetoric when it was created, it was not oriented against the USSR and is not today oriented against Russia. It follows the strategy of the Alliance which is not a pact against Moscow, but rather the defence – and possibly the extension – of Washington’s zone of influence. At its inception, NATO had hoped to integrate the Soviet Union, which would have implied a commitment from Moscow not to challenge the division of the world stemming from the Conferences of Potsdam and Yalta. Recently the Alliance met with President Dmitry Medvedev at the Lisbon Summit and proposed that Russia join the group. It was not intended to be a form of subservience, but recognition of the existing New World Order, in which all of Central and Eastern Europe now falls under the U.S. orbit. Russian membership would be a sort of peace treaty: Moscow would concede defeat in the Cold War and recognize the new division of the world. In this case, the Bilderberg Group would invite Russian personalities to its annual meetings. Bilderberg would not ask these personalities to influence public opinion in Russia in order to Americanise them, but to convince them to renounce their dreams of past greatness and glory. Here in Moscow I recently received a dark-blue folder dated 1975. It contains one of the most well-buried secrets of Middle Eastern and of US diplomacy. The secret file, written by the Soviet Ambassador in Cairo, Vladimir M. Vinogradov, apparently a draft for a memorandum addressed to the Soviet politbureau, describes the 1973 October War as a collusive enterprise between US, Egyptian and Israeli leaders, orchestrated by Henry Kissinger. Collusion and Betrayal on the Suez Canal What Really Happened ? If you are an Egyptian reader this revelation is likely to upset you. I, an Israeli who fought the Egyptians in the 1973 war, was equally upset and distressed, – yet still excited by the discovery. For an American it is likely to come as a shock. According to the Vinogradov memo (to be published by us in full in the Russian weekly Expert next Monday), Anwar al-Sadat, holder of the titles of President, Prime Minister, ASU Chairman, Chief Commander, Supreme Military Ruler, entered into conspiracy with the Israelis, betrayed his ally Syria, condemned the Syrian army to destruction and Damascus to bombardment, allowed General Sharon’s tanks to cross without hindrance to the western bank of the Suez Canal, and actually planned a defeat of the Egyptian troops in the October War. Egyptian soldiers and officers bravely and successfully fought the Israeli enemy – too successfully for Sadat’s liking as he began the war in order to allow for the US comeback to the Middle East. Vladimir Vinogradov was a prominent and brilliant Soviet diplomat; he served as ambassador to Tokyo in the 1960s, to Cairo from 1970 to 1974, co-chairman of the Geneva Peace Conference, ambassador to Teheran during the Islamic revolution, the USSR Deputy Minister of Foreign Affairs and the Minister of Foreign Affairs of the Russian Federation. He was a gifted painter and a prolific writer; his archive has hundreds of pages of unique observations and notes covering international affairs, but the place of honor goes to his Cairo diaries, and among others, descriptions of his hundreds of meetings with Sadat and the full sequence of the war as he observed it unfold at Sadat’s hq as the big decisions were made. When published, these notes will allow to re-evaluate the post-Nasser period of Egyptian history. Vinogradov arrived to Cairo for Nasser’s funeral and remained there as the Ambassador. He recorded the creeping coup of Sadat, least bright of Nasser’s men, who became Egypt’s president by chance, as he was the vice-president at Nasser’s death. Soon he dismissed, purged and imprisoned practically all important Egyptian politicians, the comrades-in-arms of Gamal Abd el Nasser, and dismantled the edifice of Nasser’s socialism. Vinogradov was an astute observer; not a conspiracy cuckoo. Far from being headstrong and doctrinaire, he was a friend of Arabs and a consistent supporter and promoter of a lasting and just peace between the Arabs and Israel, a peace that would meet Palestinian needs and ensure Jewish prosperity. The pearl of his archive is the file called The Middle Eastern Games. It contains some 20 typewritten pages edited by hand in blue ink, apparently a draft for a memo to the Politburo and to the government, dated January 1975, soon after his return from Cairo. The file contains the deadly secret of the collusion he observed. It is written in lively and highly readable Russian, not in the bureaucratese we’d expect. Two pages are added to the file in May 1975; they describe Vinogradov’s visit to Amman and his informal talks with Abu Zeid Rifai, the Prime Minister, and his exchange of views with the Soviet Ambassador in Damascus. Vinogradov did not voice his opinions until 1998, and even then he did not speak as openly as in this draft. Actually, when the suggestion of collusion was presented to him by the Jordanian prime minister, being a prudent diplomat,he refused to discuss it. President Hafez al-Assad with his soldiers in the Golan front, October 1973. The official version of the October war holds that on October 6, 1973, in conjunction with Hafez al-Assad of Syria, Anwar as-Sadat launched a surprise attack against Israeli forces. They crossed the Canal and advanced a few miles into the occupied Sinai. As the war progressed, tanks of General Ariel Sharon crossed the Suez Canal and encircled the Egyptian Third Army. The ceasefire negotiations eventually led to the handshake at the White House. Vinogradov dispels the idea of surprise: in his view, both the canal crossing by the Egyptians and the inroads by Sharon were planned and agreed upon in advance by Kissinger, Sadat and Meir. The plan included the destruction of the Syrian army as well. At first, he asks some questions: how the crossing could be a surprise if the Russians evacuated their families a few days before the war? The concentration of the forces was observable and could not escape Israeli attention. Why did the Egyptian forces not proceed after the crossing but stood still? Why did they have no plans for advancing? Why there was a forty km-wide unguarded gap between the 2d and the 3d armies, the gap that invited Sharon’s raid? How could Israeli tanks sneak to the western bank of the Canal? Why did Sadat refuse to stop them? Why were there no reserve forces on the western bank of the Canal? The First Egyptian Flag was hoisted on the eastern bank of the canal at 2.30 pm on 6 October, 1973. However, the plans of the three partners were somewhat derailed by the factors on the ground: it is the usual problem with conspiracies; nothing works as it should, Vinogradov writes in his memo to be published in full next week in Moscow’s Expert. This breakthrough of the Israeli troops to the western bank of the Canal was the murkiest part of the war, Vinogradov writes. He asked Sadat’s military commanders at the beginning of the war why there is the forty km wide gap between the Second and the Third armies and was told that this was Sadat’s directive. The gap was not even guarded; it was left wide open like a Trojan backdoor in a computer program. Israeli Defense Minister General Moshe Dayan and war hero Division Commander Ariel Sharon during the Yom Kippur War. Sadat paid no attention to Sharon’s raid; he was indifferent to this dramatic development. Vinogradov asked him to deal with it when only the first five Israeli tanks crossed the Canal westwards; Sadat refused, saying it was of no military importance, just a “political move”, whatever that meant. He repeated this to Vinogradov later, when the Israeli foothold on the Western bank became a sizeable bridgehead. Sadat did not listen to advice from Moscow, he opened the door for the Israelis into Africa. This allows for two explanations, says Vinogradov: an impossible one, of the Egyptians’ total military ignorance and an improbable one, of Sadat’s intentions. The improbable wins, as Sherlock Holmes observed. After the war, Sadat’s positions improved drastically. He was hailed as hero, Egypt took a place of honor among the Arab states. But in a year, Sadat’s reputation was in tatters again, and that of Egypt went to an all time low, Vinogradov writes. Though the suspicions voiced by Vinogradov in his secret document have been made by various military experts and historians, never until now they were made by a participant in the events, a person of such exalted position, knowledge, presence at key moments. Vinogradov’s notes allow us to decipher and trace the history of Egypt with its de-industrialisation, poverty, internal conflicts, military rule tightly connected with the phony war of 1973. A few years after the war, Sadat was assassinated, and his hand-picked follower Hosni Mubarak began his long rule, followed by another participant of the October War, Gen Tantawi. Achieved by lies and treason, the Camp David Peace treaty still guards Israeli and American interests. Only now, as the post-Camp David regime in Egypt is on the verge of collapse, one may hope for change. Sadat’s name in the pantheon of Egyptian heroes was safe until now. In the end, all that is hidden will be made transparent. Israel Shamir is a critically acclaimed and respected Russian Israeli writer. He has written extensively and translated Joyce and Homer into Russian. He lives in Jaffa, is a Christian, and an outspoken critic of Israel and Zionism. Israel Shamir can be reached at adam@israelshamir.net.